As we begin the countdown to ending another year, we take a look at the weather events that made 2014 memorable, weather-wise. 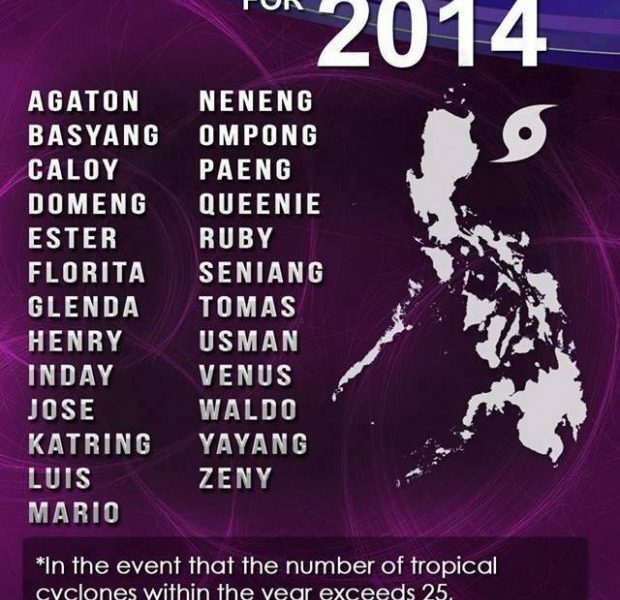 This year, a total of 19 tropical cyclones entered the PAR (Philippine Area of Responsibility). The first was Agaton, which made its entry last January 17. Though it was identified as a Tropical Depression, the lowest category for cyclones, Agaton caused severe flooding in Eastern Visayas, Northern Mindanao and the CARAGA region. According to the National Disaster Risk Reduction Management Council (NDRRMC), 244,344 families were affected in more than a thousand villages in 16 provinces. There were at least 1,147 houses destroyed and more than one thousand partially damaged. All in all, damages in infrastructure and agriculture were estimated at more than 500 million pesos. From the 19 tropical cyclones that entered PAR, 10 were under the Typhoon category with wind speeds of 118 to 220 kilometers per hour. From these 10 typhoons, Ompong and Ruby could be categorized as Super Typhoons. Entering PAR on October 7 and making its exit on October 11, Ompong, with international name Vongfong, was classified by the U.S Joint Typhoon Warning Center as a Category 5 Super Typhoon. Packing maximum sustained winds of 215 kilometers per hour and gustiness of 250 kilometers per hour, Ompong—thankfully— did not hit the country as it re-curved towards Mainland Japan. But Typhoon Ruby was totally different story. With the fitting “Hagupit” as its international name, Ruby entered the country’s boundary on December 3 and made its way out on December 11. With maximum sustained winds of 215 kilometers per hour and gustiness of 250 kilometers per hour, Ompong made five landfalls. The NDRRMC filed a total of more than four million residents affected in Regions III, IV-A, IV-B, V, VI, VII, VIII, CARAGA and the National Capital Region. 18 deaths were recorded while injured persons reached up to 916. Ruby damaged mostly infrastructure and agriculture—the total cost amounting to more than 5 billion peos. Due to its devastating impact, a state of calamity was declared in San Pablo City in Laguna, Batangas, Albay, Camarines Sur, Catanduanes, Masbate, Naga City, Juaban and Gubat in Sorsogon, Sorsogon City, Aklan; Maayon, Dumalag and Panay in Capiz; and Northern and Eastern Samar. Because fatal storm surges brought by Typhoon Yolanda in 2013 made the public more aware of this weather phenomenon, Ruby kept Filipinos on their toes. Coincidentally, while Ruby was inside PAR, an astronomical event happened. This was the Full Moon phase, which caused higher tidal variations due to our satellite’s strong gravitational pull. Weather forecaster Chris Perez explained that higher waves were expected due to the combination of storm surge and the effects of the Full Moon. PAGASA officially announced the start of the Hot and Dry season last March 26. Easterlies, the prevailing wind system during this time, brought hot and humid weather to the country. Aside from the easterlies, this season’s indicators included the presence of the High Pressure Area (HPA), which brings good weather conditions, the termination of the northeast monsoon, and the increase in temperatures. Upon the onset of the Hot and Dry season, the country undeniably experienced a number of scorching days that were especially evident in the Luzon area. In March, Tuguegarao recorded a maximum temperature of 37.9 degrees Celsius. But its days got hotter in April and May, which brought in temperatures of 39 degrees and 39.8 degrees consecutively. Meanwhile, the Science Garden in Quezon City documented a high of 36.7 degrees Celsius in May. Within this year, the El Niño phenomenon became a hot topic during the hot season as PAGASA continued to monitor the ups and down of sea surface temperature. From April 21 to 28, PAGASA recorded a substantial increase in the sea surface temperature anomaly from 0.2 to 0.4 degree Celsius. It was then forecast that El Niño might reach its peak in the last quarter of 2014. But with the recent report from the International Research Institute for Climate and Society, only weak El Nino conditions were observed in November and December. •	5-day period with a total rainfall of 25 millimeters or more in three consecutive days. The Amihan season was officially declared by PAGASA on October 16. The northeast monsoon or amihan is the prevailing wind system, bringing light rains to its affected areas. It also has cold and dry characteristics, resulting to colder mornings. At this time of the year, a gradual decrease in temperatures was observed in different parts of the country. Winter season in the northern hemisphere officially started on December 22 this year. This also signaled the start of experiencing longer nights and shorter days in the Philippines. During the winter solstice, the northern hemisphere leans the farthest distance from the Sun, causing longer nights and lower temperatures for those in the northern hemisphere. The opposite happens in the southern hemisphere where people experience the longest day. Although a lot has happened this year, there’s more to come this 2015. So brace yourself for those inevitable storms, but remember to keep to the sunny side of the street. With all the changes the weather brings, one thing stays the same: the Filipino brand of resilience that knows no bounds.